First, the condition of the structures. I’ve seen pictures taken by urban explorers of buildings that have been abandoned for 25 years. They look like the buildings in F3. Roofs collapsing from water damage, dust and trash littering the floor, broken bits everywhere. But the F3 buildings have been rotting for 200 years. If Life After People and similar works can be believed, the buildings should be much more decayed. No wood should survive intact, especially if it’s structural; the radiation can’t be bad enough to kill the things that eat it, or everything else would be dead. Unmaintained concrete or brick should have eroded away. Steel should be shattered rust. Aluminum or rust-resistant steel might survive, but they’re not that common in building materials. Buildings survive because people maintain them. They keep them at a stable temperature and repair leaks or breaks. They exterminate termites and clean gutters. The ruins of DC in the game are not maintained, which would be deadly in the low marshland of DC. Notably, the active settlements aren’t well-maintained either. Walls are cracked, rust is everywhere, and sometimes litter is scattered on the floor. That means bugs, rot, and unhappy residents. The first thing you do when your basic needs are met is make your living space more pleasant. Prisoners decorate their cells; why don’t the well-supplied residents of Megaton paint their walls? And that brings us to the question of supplies. How are these people fed? If they truly subsist on leftover, decay-proof, pre-War food as the game implies, then why aren’t the ruins around the settlements devoid of these things? Towns claim to send out scavenging parties, but everywhere you find food sitting in unlocked boxes as if the bombs just fell. Raiders live in buildings with full first-aid kits and working computers blocking access to rooms of supplies that could be accessed with two people and a big prybar. The old Fallout games got it right. Buildings that aren’t inhabited are either gone or nearly so. Buildings where people live are mostly clean and well-maintained. People farm for food and organized caravans to trade despite the raiders and mutants. Technology is increasingly available. But 36 years after the events of Fallout 2, people are wasteful, sloppy, and stupid. The main problem is that Bethesda wanted to portray a postapocalyptic game of grime and the struggle to survive, but did it in an established world where people have had seven generations to sweep up and get their act together. The solution? Set the game just after the bombs fell. The main action of my Fallout 3 would take place in 2100 or so. The Vaults have begun to open (many are set for a 20-year release time), and the conflict between irradiated survivors, pampered vault-dwellers, and mutated ghouls has just begun. The buildings are ruined but still standing, and they haven’t been picked clean by scavengers. Keep the idea of Super Mutants created by a modified FEV. Keep the Brotherhood of Steel spin-off, but make them a small expedition sent from the West Coast to investigate the Capitol who are just starting to resort to a religious approach to recruit traumatized survivors. Instead of the Enclave, use the genuine remnants of the US government who have descended into even worse corruption than their pre-War atrocities. Make the Great War a playable event. Start the player as the parent of the final player character, for instance, and let them play through their character creation choices: do you make it into a Vault? Do you shelter from the radiation? Do you become a ghoul, and play as your initial character after all? Then do a time skip forward to the more socially interesting part of the game. The problem with making a direct sequel is that the Fallout universe is pretty stable and established. If you try and make a sequel about scavenging and exploring ruins, you run into a problem with both the decay of pre-War artifacts and the organizational capability of the survivors. People wouldn’t scavenge and live in decaying husks. They’d tear down the old buildings, build decent houses out of the scraps, and set up a nice farm for themselves. And if you make a game set in the clean, civilized, recovering world of 2277, it won’t feel much like Fallout. I haven’t played New Vegas, so I don’t know if that game uses a clever approach to a post-Fallout 2 Fallout game. But to me, setting the game in Washington, DC provides a brilliant opportunity to explore the early years without worrying too much about violating established continuity. It’s a shame Bethesda squandered that chance by using their own dubious vision. I’ve always liked the intro sequence to the old Origin post-apocalyptic game Bad Blood. 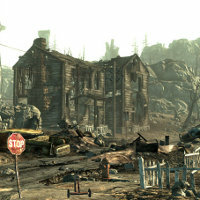 Starts with a view of a farmhouse surrounded by lush fields, then white flash, mushroom cloud, farmhouse is charred ruins. As the credits are displayed, the scene transforms through a series of fades. First a lean-to and a campfire are visible inside the ruined farmhouse, then a few more, then the remains of the house are entirely replaced by a crude dewlling that presumably used all the salvageable wood, and after a few more such transitions it’s a fortified settlement with a stockade, which is where the game begins. The area in New Vegas wasn’t hit by the bombs, and there is at least one (guarded) open-air farm visitable in the game, so it’s a bit better in that respect. I like the dynamical meaning that the game creates by having me run around scavenging, fighting, and conducting some bland diplomacy, and I even like the general theme of a ruined future-past, but all of the actual meaning created by symbols and signifiers in the game are [nonsensical]! Maybe they could have explained that all of the humans are dumb now because of a radiation side effect, and so they continue to somehow maintain the world in a ruined state without building anything new. Maybe that would help with a few discrepancies. But the architecture of all of the buildings is tedious, namely the condition they are in and the way they all feel the same inside. i never knew the year in follout 3, for me it was just after the bombs fell. other than that it was k.
Fallout New Vegas does have farms. There are at least two, one near New Vegas, and many small ones in the starting town, Goodsprings. However, there are also many wild fruit and plants that you can collect. There is a town in the northwest which does have trees. There is also a Vault which has various plants overgrowing the outside of it, and more on the inside. There is a better sense of a developing, growing frontier in FNV. New Vegas–as in the titular town–itself is almost an affront to all the ramshackle developments in F3, as its a fully-powered, well-maintained independent state unto itself (not completely self-sufficient, though, as will become evident in the game). It helps that one of the running themes throughout the game is the development of civilization among the frontier, with the differing factions having different viewpoints on the subject. Any lack of development in FNV could be assigned to the fact that much of the territory is contested territory, as the numerous bases and makeshift camps throught attest to. As for F3, I try not to let it bother me too much. I figure that the developers just wanted it to be far removed from the continuity of the previous games so they could defray any fan complaints. Obviously, this strategy wasn’t quite effective.